The gap between the share of Americans who get news online and those who do so on television is narrowing. As of August, 43% of Americans report often getting news online, just 7 percentage points lower than the 50% who often get news on television, according to a Pew Research Center survey conducted in August. 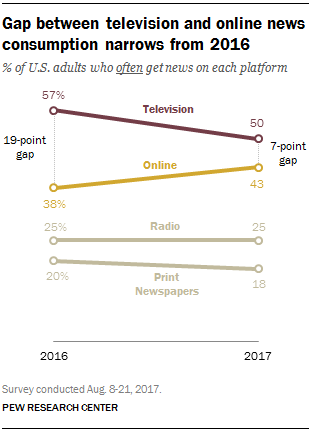 This gap between the two news platforms was 19 points in early 2016, more than twice as large. The share of Americans who often get news from TV – whether from local TV news, nightly network TV news or cable news – is down from 57% in early 2016. At the same time, the portion of Americans often getting news online, either from news websites/apps or social media, grew from 38% in early 2016 to 43% today. What’s more, the decline in television news use occurs across all three types of TV news asked about in the survey – local, network and cable – but is greatest for local television news. As of August 2017, 37% of Americans said they often get local TV news, compared with 46% in early 2016. The other two platforms asked about in the survey – radio and print newspapers – are about on par with last year in terms of reported consumption. A quarter of Americans often get news from radio and 18% do so from print newspapers. 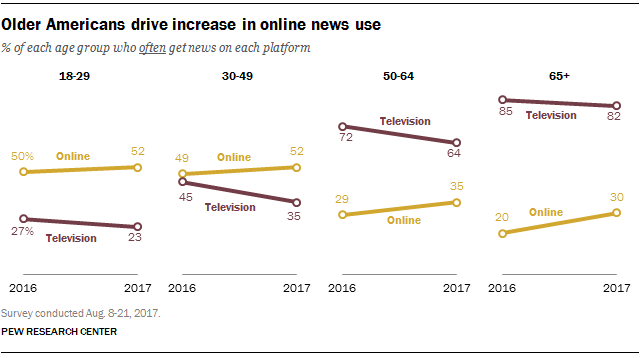 The rise in online news consumption plays out across demographic groups, especially when looked at by age. The two oldest age groups saw considerable increases in online news use – 10 percentage points for those 65 and older (30% vs. 20% in early 2016) and 6 points among those ages 50 to 64 (35% vs. 29%). The pattern is in line with previous findings that show that recent growth in mobile news was driven by the oldest age groups. The decline in television as a source of news occurs both among 50- to 64-year-olds and 30- to 49-year-olds. The portion of those ages 50 to 64 who often get news on TV fell from 72% in 2016 to 64% today; for 30- to 49-year-olds, this declined from 45% to 35%. And while 18- to 29-year-olds did not show any significant change in their use of television news from early 2016, it was already substantially lower for this age group than for those 50 and older. Indeed, even in early 2016 this youngest age group was about twice as likely to often get news online as on TV (50% vs. 27%), about as large as the gap seen today (52% vs. 23%). Getting digital news often also increased among nonwhites (up to 45% from 36% in early 2016) and the less educated – those with a high school degree or less went up to 34% from 25%. This is in line with other research showing that these two groups also increased in the portion that ever gets news on social media. Note: Read the full methodology and topline results here. Elisa Shearer is a research associate focusing on journalism research at Pew Research Center.